Traveling a lot to ride and race bikes, I’ve always thought about a trailer, rv, camper, bus or something. 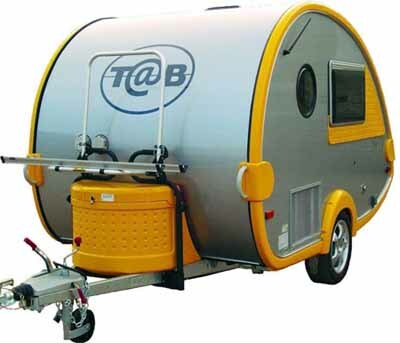 Yesterday I spotted a T@B trailer on the highway and it looked cool, designy, and spiffy. There’s a bike-rack option and even better, I bet you could put two bikes inside the trailer. Check this flame paint option with the banana seat bike.